This is one of the original forms of Strelitzia from South Africa. A striking plant with big glossy banana-like leaves and fantastic orange flowers in spring. Mature plants produce lots of flowers in a good spot – sunny and well fed. 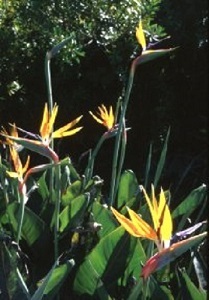 Strelitzia tolerates shade (with fewer flowers) and coastal sites. But does not like temperatures below -4°C, so plant in a protected and well mulched site in warmer UK gardens or Mediterranean gardens or keep in pots to be moved indoors in frosty weather. Pack of 8 seeds. Sow in spring to autumn. Flowering generally starts in the 3rd season. 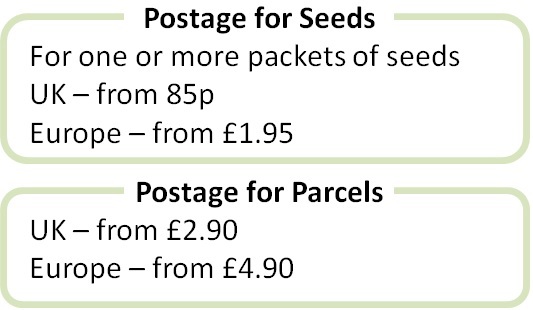 Sowing instructions and a colour photo are printed on the packet. Sow Remove the orange fluff from the seeds and soak for 24 hours in hot water (not boiling). Change the water once while soaking. Then sow in seed trays to a depth of 1.5 times the size of the seeds. Keep at a constant 25°C and germination takes 4 -8 weeks, longer in cooler conditions. Pot on when seedlings are big enough to handle and keep protected and in the shade when young. Grow Plants tolerate cold to about -4°C so protect well or grow in pots and move indoors in frosty weather. Plants generally start flowering from the 3rd season. They flower more in a sunny and warm position. Clear back dead flower stalks and untidy leaves after flowering or in spring. Do not cut back all the leaves – they will re-grow, but flowering will take another 2-3 years. Water and feed regularly and re-pot as needed. Mature plants can be divided in spring. Rooted suckers can be removed and potted up in spring. Protect plants under glass from red spider mites. See Growing Advice for more information on growing Strelitzia.